The Movies that Make a Difference! A person's high regard for the Nuremberg Trial tends to be taken down a peg or two upon learning that the American prosecution team offered a shrunken head into evidence, blaming the Nazis for what obviously came from a South American rain forest tribe many years prior. Toward the end or World War II, U.S. armed forces entered the German wartime concentration camp at Buchenwald. The first Americans to become active there were officers of the Psychological Warfare Division. They had a plan: to plant "evidence" in the camp that suggests the German SS had committed atrocious war crimes against the Buchenwald inmates: shrunken prisoner heads, lampshads made of the skin of murdered inmates, etc. Much of this "evidence" was later used during the Nuremberg trials and other similar legal mockeries as evidence against German defendants. From there this atrocity propaganda entered the history books of the world, and the world believed it, and it still does. The video maker advocates kindness and good vibes toward all Jewish people. And the video maker does not have the intention of reviving Hitler or Nazism. Hitler was a militarist and this video is anti-militarist. Having said that, the maker of this video also believes that the holocaust is a giant myth. A myth that reverberates today into the promotion of war. This video is about how the media and politicians manipulate the gullible American public and much of the rest of the world for pro-war purposes then and now. One less frequently exposed example for this war-mongering: The notion that Uganda's Idi Amin was likely portrayed as a psycho-killer due to his anti-Israel views and Arab alignment. Idi Amin was probably not someone who thought he was "the last king of Scotland," as the movie about him was titled. This video has considerable overlap with the more recent documentary "Buchenwald: A Dumb Dumb Portrayal of Evil," which among other things describes Eisenhower's role in the holocaust hoax. This documentary has been augmented by 11 brief written essay posted on the author's homepage, which are worth reading as well. They overlap with the new Buchenwald video as well. Suggestion: After watching "Nazi Shrunken Heads," then watch "Buchenwald" and afterward, go over these 11 topics. 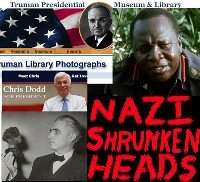 This is "version 2" of Nazi Shrunken Heads. Originally released in April 2007, it was re-worked and re-released in August 2008. It comes in five episodes with together 23:56 min. Copyright Notice: This movie has been released to the public domain for educational purposes only. It may be copied and distributed free of charge only. No commercial use is permitted. If copied and distributed, no changes to the movie are permitted without the prior written consent of the author/director of the movie.